SM long qualification race - small mistakes at 2, 4, 13, map at 14 was dodgy as can be seen by me stopping too early in 'not green'. Scrappy on 15 also. 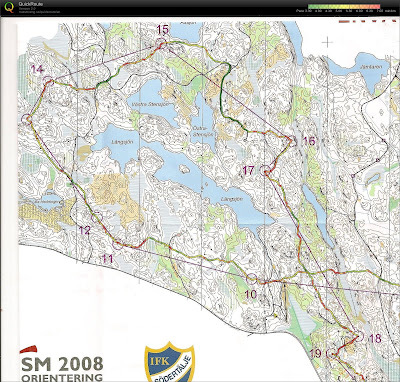 Really nice training south of Stockholm with Tom Hodel who is staying with me this week. We regrouped every 3-4 controls. Very detailed map in places, especially at the end. I ran pretty well, except when I tried to miss one control out at the north end, and had to run back to the previous one. The last loop was fantastically technical. I was pretty tired after the weekend so I hung some tapes for Tom and Erik on the map next to 25manna terrain. 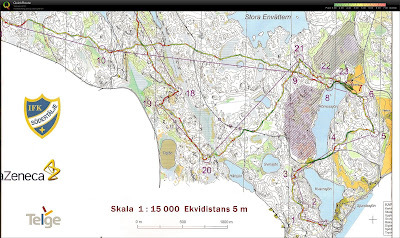 Pretty nice, standard Swedish city forest map. Fast but still requiring a lot of concentration. First time I have used pin-punching in about a decade. Forgotten all about control cards and how to attach them to myself. 8th place today in the final. Really happy with my performance - I ran well almost every control. 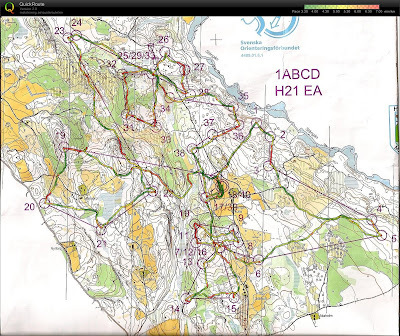 The course was quite 'easy' and fast, but that is good for me. I caught Martin Johansson half way and ran together for some, but then I chose a different route choice and got a little behind (the 18th - he ran to the road). Then I was really pushing to catch him and I made a bad route choice to 19 and missed 20 a little. I saw him again the last few controls though. 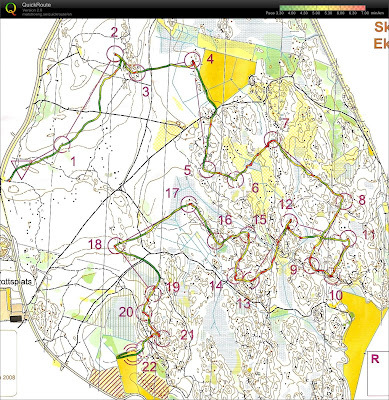 I didn't make the best start, with small mistakes at 3 and 4 (came out of 3 through the stony ground and lost time), but then I had a really good section from the 7th (spectator) to the first radio, only losing 15 seconds to Peter Oberg in 30 minutes running. I felt strong at the end - I think this is the best classic distance form I have ever had, and almost definitely my best ever classic race performance, both technically and physically. I lost around 2 minutes technically, and around the same physically, so that is very positive. No map yet because the final tomorrow overlaps today's race, but I ran well enough to qualify second in my heat, 1 1/2 minutes behind the winner Michal Horacek. 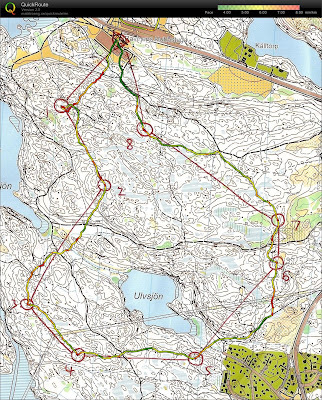 Looking at splits, I was running very fast, but was also scrappy in the circle, with 6 small mistakes close to the control (totalling 3.40). I need to improve this for tomorrows race, but in general I am satisfied with today. 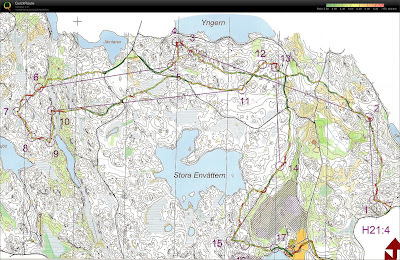 The terrain was nice, fast and detailed, except for one area near the finish where I didn't like the mapping of the vegetation (surprise surprise). I felt strong and had good split times in general, so I can be confident especially with a nice start time around some really good runners. Only 4th today, I had a really bad race, and finished almost 6 minutes behind Emil (nice return to form for him just in time for SM!). 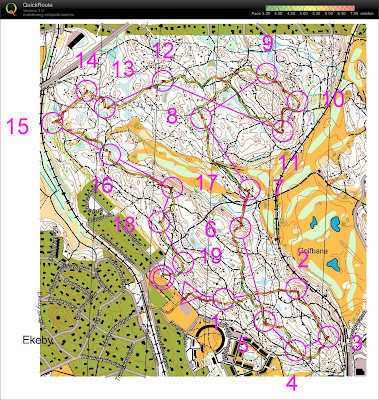 Maybe it was the change of scale, or I was trying too hard, but I spectactularly failed to orienteer well for the first half an hour, missing 4 minutes on the first 6 controls (15 secs at 1, 1 min at 3, 45 secs at 4 and 2 mins at 6 where I was amazingly stupid). I ran better after that, but lost some time on my route to 11, and then a small miss at 12 was followed up by a 90 second mistake at 14. As can be seen from the track, I ran right past it twice without seeing it! I was caught at this point 6 minutes by Jacob Jansson from Jarla. That was the mental slap I needed, and I had a fantastic race after that to the finish, losing only 34 seconds to the best splits (and half of that was on number 21) in the last 30 minutes. Much tougher terrain than yesterday. Bigger hills, and really broken ground with lots of fallen trees in places. Now it is time to rest up for SM. I have had a fairly hard few weeks, not high hours, but the intensity has been very high with a lot of hard running and races, so I need to try and let my body recover as much as possible before the long distance champs next weekend, middle and relay the weekend after that, and then the World Cup final in Switzerland to round off a tough month. Today I won the district champs in middle distance to go with my district sprint title in the spring. 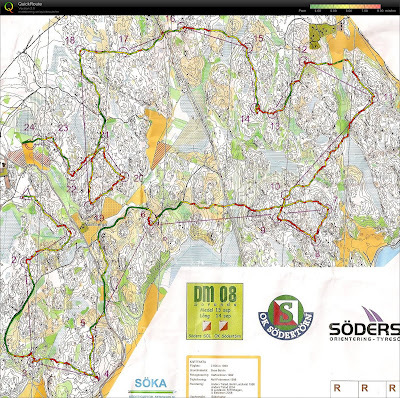 The race was down in Södertörn in some really nice terrain. It was quite varied with the first controls in lightening fast no so detailed terrain, then parts were on very detailed hill tops. It was important to stay in control all the time in these parts, and trust the compass in the less detailed parts. 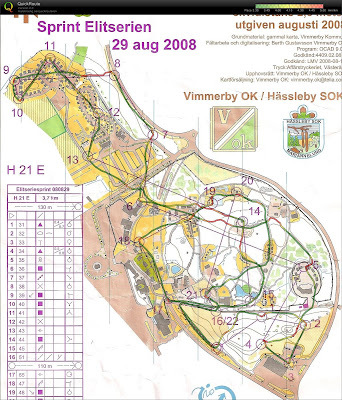 I had a pretty good race, pushed from the start, and only lost control once on the approach to number 12 when I was distracted by a runner punching a different control on a similar looking feature. I relocated quickly and lost around 40 seconds. 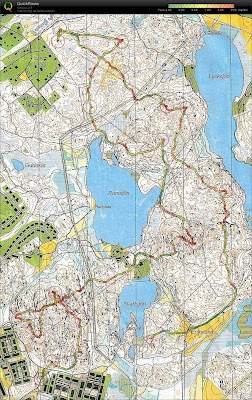 Apart from that I was pretty satisfied with my race, but looking at the splits, I lost around 20 seconds on the 2nd control, and a few seconds at 10, 14 and 22 (maybe 5-10 seconds each), but I think it was that kind of terrain where you can go the wrong side of a hill and through a rocky patch and lose a few seconds. The main competition, Holmberg, Lowengren and Lauri all ran pretty badly, and it was Näsman and Peter Hemmyr who took 2nd and 3rd, about 50 seconds behind me. Tomorrow is the DM long distance, so hopefully I can take that too! Today I ran the Stockholm Half Marathon. I've never run the distance before, and it was my first road race since May 2007 (I think...). My goal was 70 minutes based on the fact the weather would be good and the course would be flat and fast. And flat my arse, felt like only about 5km was flat, the rest was up and down over and under bridges and loads of small climbs. Managed to just about keep warm before the start, and stuck to my tactic of starting slow and trying to keep a steady pace. Ran the whole race overtaking people - I don't think a single person passed me! Ran 16.34, 16.46, 16.20, 16.39 5km splits, and 3.42 for the finish. Fluctations due to hilly bits / flat bits. My finish time was 70.03, but I am sure I crossed the finish line 5 seconds quicker than that :(. Anyway, really pleased with the time and the way I felt. The first 10km in 33 mins felt easy, it was tough after that, but I felt really good around 12-18km, then the last 3km was a real struggle. I feel on a nicer day and a flatter course I can run maybe a couple of minutes quicker. Also basically any white 'runnable' forest on the map was green swamp jungle, and I can't see that it can ever have been white. I made the mistake of thinking white meant runnable, and I lost a lot of time - 20 seconds on number 6 alone! The forest outside the park (around the first controls) had really high vegetation, and I would have used green stripes there. People were also complaining about other things, and rightly the race was removed from the Eliteseries after a number of protests (here if you can read Swedish). Apart from that it was a nice venue for a race, and I ran ok. I seem to be in really top shape at the moment and I had a number of fastest and good splits. Finished 7th though, about 30 seconds behind. Sunday was a long distance race with a mass start and with butterflies as forking. It seems to me that butterflies really aren't effective - many times they have the opposite effect, bunching runners up, and so it proved this time as well in my opinion. Far better were the really long legs with big route choices (not that there were many in this race). I ran quite well, trying to stay near the front without doing too much work. I actually took the lead on the way to the 6th, and then lead on my forking from 10 to 15. I lost a little on 14 and 15, and dropped to around 8th. Then on the way to the 19th I decided to run on my own to the south and up the track. That was really good and at the top of the hill I was alone with a huge group behind me. Then I made a stupid error (around a minute) approaching the control and I was back behind chasing. I was chasing what I thought was the lead group (although actually Haldin and Karlsson got away with a better route to 19) all the way from 20 to 25 (despite their shocking route choice to 23), and I caught them again in the butterflies. Although by that point people behind taking a better route to 23 had caught us also. Then it was a bit manic around the second butterflies. My group ran the first one well, but messed the 2nd up, especially 31, so we came back to the central control maybe 30 seconds behind a big group from the other forking. The fastest of us chased them down and there was a sprint finish from number 35 to the finish. At control 33 I was 17th, and then I took 4 places to 36, and 6 places on the climb to 37! I finished 7th, 20 seconds behind a lightning William Lind. Good tough race. Fun to do these occasionally, and nice to know I have the fitness to fight to the finish.